Bringing thousands of people to your blog is not a herculean task, at least nowadays. You can either make use of so-called Social Media Marketing or Search Engine Optimization techniques for the mentioned purpose. Nevertheless, at least nowadays, the real problem is all about forcing visitors to stay on your blog along with developing the tendency to visit your blog again. Even though there are various factors such as the integrity of content, structure of content etc, loading speed of your blog makes sense. As you might know, loading speed means the time taken by your blog to finish displaying all contents, including images, text content, widgets etc. You can simply guess the thoughts of your visitor when he has to wait minutes, for reading your blog, especially in this faster internet era. We can simply call the thought ‘horrible’. Thus, as a blogger, it is your prominent duty to gift a faster loading speed to your blog so that your visitor can get the actual content of your blog much faster. People have been developing ideas for fighting against this problem and the effective solution, ever found, is Content Delivery Networks. Among these networks, MaxCDN is one of the best products you can get. Before jumping to the product, let us tell you a bit about content delivery networks and their working principle, used by a many web giants, including familiar ones. According to Wikipedia, Content Delivery Network, commonly known as CDN is a distributed system of web servers that are located in different data centres of globe. As we mentioned earlier, one CDN has the prominent function to offer high-end performance and availability to each user of your site, visitor when it comes to a blog. According to reports, thousands of websites and web applications make use of these networks in order to serve content such as text, scripts, heavy-sized graphics, files you can download as well as media for live-streaming. Obviously, your favourite social networks including Facebook are also using this technology to offer good speed. We guess words are enough to prove the inevitable property of CDN in your blog when you want to serve your visitors better. The following image can give you a strong idea about CDN. The right section shows the CDN system. The way of working of CDN is quite simple! When you type the address of a blog, powered by a CDN, there are some slight changes in the whole process. 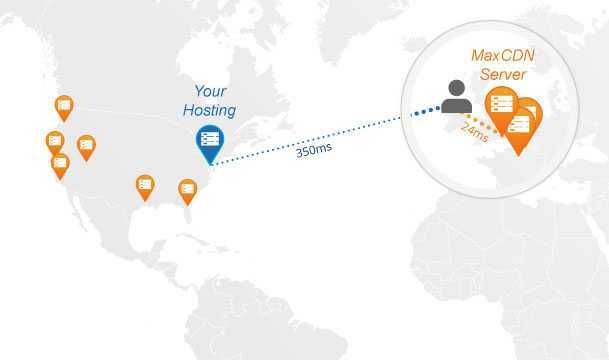 Rather than contacting the normal server, CDN helps to find the physically closest and high-performance web server in order to serve visitors better. In addition, a section makes use of a technology similar to Web Cache to faster your visits. Rather than approaching the original server every time, CDN accesses the desired content from Edge servers, which makes the loading process quicker. Nevertheless, your DNS will reach the original one if cache gets expired or erased. Viewing all these stuff, Content Delivery Networks are a good way to fasten your website. As you can read from the name, MaxCDN is one of the best Content Delivery Networks, available for a truly reasonable price, but never compromising service’s quality or reliability. As you can guess, the service keeps its servers all around the globe so that they can bring content to a user, from any part of world, with exceptional fastness. The services started its journey back in 2009. This product has affiliation with NetDNA, one of the best but expensive CDN for big sites. In these four years, MaxCDN has added many web giants into their client list including Mashable, stackoverflaw etc, as well as providing the optimum service to each customer; no matter they are bigger or not. When compared to other solutions, reports also say that customers are much satisfied, as they can improve the loading-time of their blog and hence increase user-engagement. Now, let us check out the superb features of MaxCDN, which makes it different from other solutions. Doubts are much usual when using such a web-based service, which is more technical. 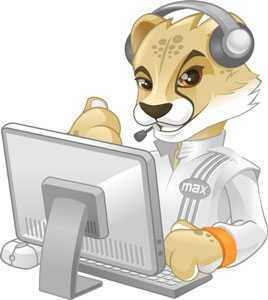 In that sense, MaxCDN is a rich service, as it has an exceptionally superb customer support. The first time you visit the website, you can make use of live chat for solving doubts you might have. Of course, you can expect 24*7 supports, as a user of MaxCDN. However, there is also a 30-day money back policy; you can make use of, if you do not like the service. Both these options are enhancing the user-support section of MaxCDN. Setting up MaxCDN for your blog requires no major technical knowledge, as you can make use of the 5-minute installation. You have to sign up for the product followed by the payment. Then you have to add your website in the service. After that, you can select the platform of your blog/website and get the appropriate plug-in. MaxCDN support platforms such as WordPress, Joomla, Magento and Drupal etc. 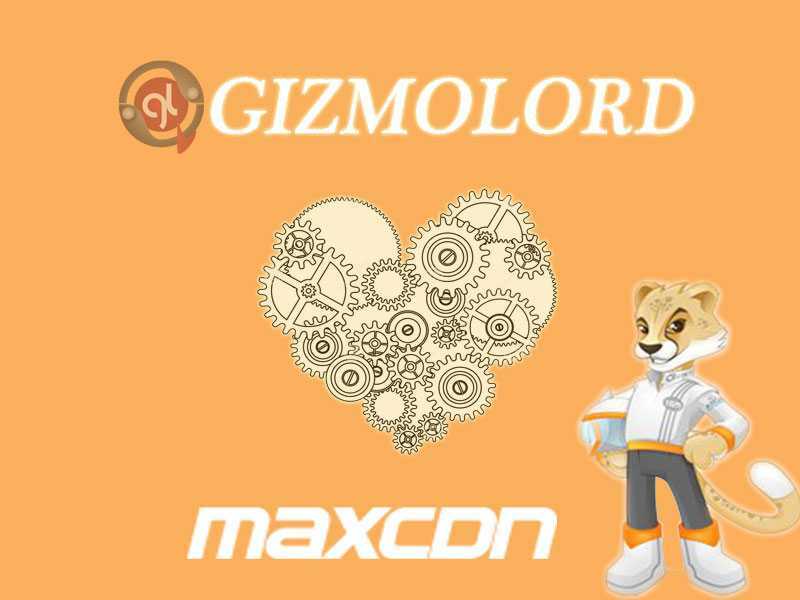 Once you have successfully integrated the plug-in with your blog, you have done with MaxCDN installation. This famous 5-minute-installation is a major factor, indeed. There is also an option to host multiple websites in single account, especially if you have large amount of bandwidth capacity. Once you have integrated MaxCDN with your blog or website, you can see a comprehensive dashboard to keep an eye on performance of your website. 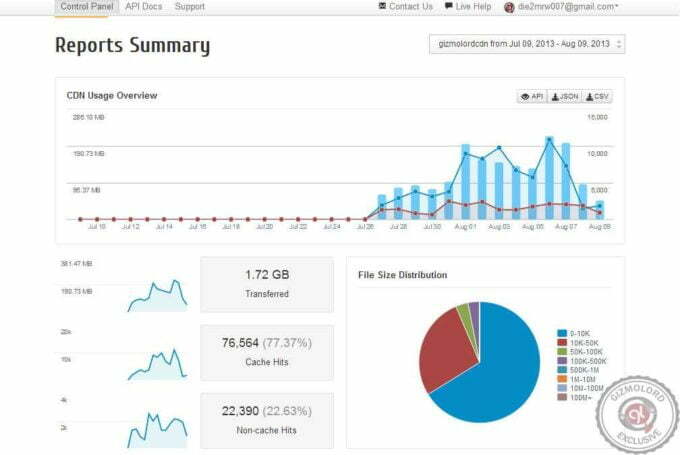 In the dashboard, you can analyze the summary of performance, how much data you have used until the moment, as well as management of services from the company. For a typical newbie to world of CDNs, the dashboard is damn useful indeed. Apart from normal CDN services, MaxCDN has more to offer, which can indirectly help you to in the enhancement of user-engagement. Major ones include EdgeSSL – made for secured websites and blogs, Asia Network – for decreasing page load time for visitors from Asian continent and EdgeSecurity for securing hosted content. For enterprise-type web ventures, annexation of these services would be priceless. Above all, MaxCDN has an impressive set of price tags, which can match your budgets. 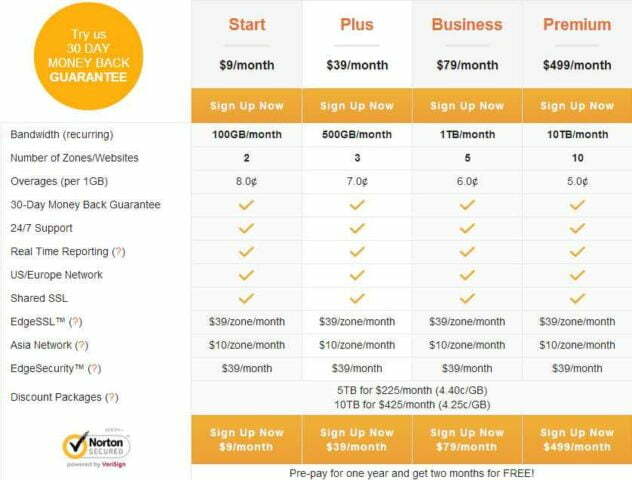 You can start using their service by paying $9 and purchasing the starter plan. In addition, there are some pro type plans, which cost around $500 months. There is not much problems if your site goes beyond the bandwidth because the recurring rate per GB is much lower than you expect. Moreover, if you get traffic, using bandwidth more than 10 TB, you can contact the company for enterprise solution. When there is a comparison with other ventures, MaxCDN has truly reasonable price tag, accompanied by several useful features. Recalling what we mentioned about MaxCDN earlier, it is apparent that the service has a drastic effect on the user-engagement and page loading time of your website or blog, which is indirectly supportive towards your earnings from the venture. Hence, even though you have to pay a decent amount for the product, the money will return to you along with a doubling effect. Integration of MaxCDN with most of top internet service providers is also making the product reliable. In addition, some ventures and personal findings have proven that the use of MaxCDN has made a noticeable change in the traffic as well as the decrease of bounce rate. According to the words of MaxCDN, the web giant, Amazon has found that website loading speed had a drastic increase followed by the integration of MaxCDN. We hope that the previous statement is enough for those, who demand scientific proofs. However, we recommend you to use this service, as a blogger who loves to welcome their esteemed visitors.